Andre Hal helped the Texans break a two-game losing streak. Chuck Pagano's decision cost the Colts any chance of beating New England. 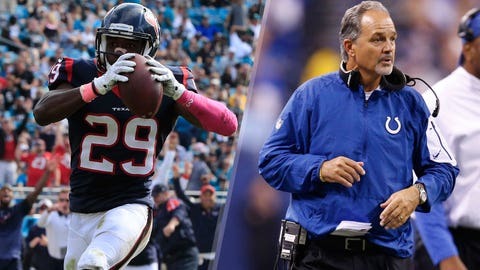 With Week 6 in the books, let’s take a look at three AFC South players who saw their stock rise, and two (plus one head coach) who saw it fall as we look ahead to Week 7. Hal, making his first career start, came up big in Houston’s 31-20 win over the Jacksonville. The converted cornerback, starting in place of the injured Quintin Demps, picked off two Blake Bortles passes, the second of which he returned 31-yards for a touchdown. The Titans struggled in Sunday’s blowout loss to the Dolphins, but Walker did not. The veteran tight end, who has emerged as one of rookie quarterback Marcus Mariota’s favorite targets, caught eight passes for 97 yards against Miami. Walker’s 97 yards receiving were the third-highest total of his 10-year-career. Hoyer cemented his status (at least for now) as Houston’s starting quarterback with a standout performance in the win over Jacksonville. The seven-year veteran, making his first start since the season-opening loss to Kansas City, completed 24 of 36 passes for 293 yards and three touchdowns, with no interceptions. Hoyer also posted a robust passer rating of 119.3. While his counterpart Brian Hoyer shined, Bortles struggled in the loss to Houston. The second-year quarterback threw three interceptions, including the two to Hal. After the game, head coach Gus Bradley told reporters he felt as though Bortles was pressing too much trying to make plays. Credit goes to Mariota for staying in the game and playing through pain after spraining his MCL on a low hit by Miami defensive end Olivier Vernon in the second quarter. However, the rookie was responsible for four turnovers, throwing a pair of interceptions and fumbling twice. While Mariota’s toughness is admirable and the Titans’ suspect blocking up front also deserves blame, it’s difficult to win turning the ball over four times. Call it a "communication breakdown." Call it a boneheaded play. Call it whatever you want, the fake punt attempt gone way wrong cost the Colts any real shot of beating the Patriots Sunday night. It simply should not have happened.